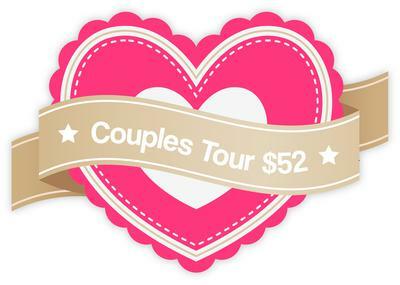 Couples Pub Tour - Discounted Pricing All of February 2015! The Original Pub and Brewery Tours of Charleston are pleased to announce our first Couples Tour to celebrate Valentine’s Day throughout the month of February. Couples receive special discounted pricing the entire month to celebrate love, fun and togetherness they share. Our Couples Pub Tour is a two and a half hour walking tour of one of the most historic parts of Charleston. We visit 3 to 4 pubs and bars where our guests can purchase local craft beer, wine or their favorite libations. The tour is led by a licensed Charleston tour guide and some light appetizers are included.